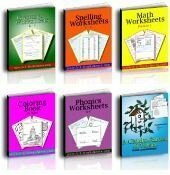 We have writing worksheets for kids that offer copywork, manuscript and cursive writing practice, and creative writing ideas. 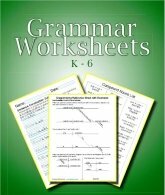 Great for Kindergarten through Sixth Grade. We have hundreds of free printables for writing, handwriting, and timelines. In the beginning tracing and copying are what teach little ones the model of good writing. After that it's good to give ideas, lists of words, and even write what the child says so that he can make the connection between his own thoughts and the written word. Later, writing about an event or giving how-to instructions are very helpful creative writing exercises. One of my favorite thoughts about the language arts is that old timers had their students work through one hard book. Guess what? Ever after that the student could read anything! Writing skills are the same in many ways. We've seen this sort of success in many students, especially if the writing corresponds with reading assignments. That's why book reports can be so helpful for children to gain writing skills. Think of how often we ourselves take notes in order to learn or remember a new thought. Taking notes in college was the way that I learned and "studied" best. Teaching writing requires teaching kids punctuation, capitalization, and grammar. 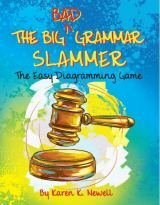 These writing worksheets teach sentence construction with I am, you are, he is, we are, you are, and they are, etc. 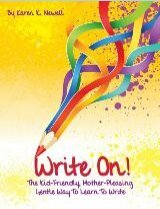 Teachers, parents, and homeschool families will rejoice to find this writing treasure for their students! Anyone helping elementary school children with writing skills will rejoice. I recommend Karen Newell's Learn4YourLife homeschool writing curriculum for any age. Here's a bit about her Write On writing curriculum: Write On is a gentle writing curriculum that builds writing skills while motivating students to write. It sparks the student's interest by offering a wide variety of writing styles which capture their imagination. Short, simple assignments decrease student's reluctance to write, while increasing their confidence by focusing on one specific written skill. Young writers become eager to share their creations that express their ideas about their favorite topics. Karen Newell is an experienced CNM and homeschooling mother that packs her books with simple treasures! You can learn more about her Write On - Creative Writing Exercises here.